If you are in my FB contact list, you would know that Hobbit and I attended a dear friend's birthday getaway.It was a fun-filled weekend. Here is feather flags. 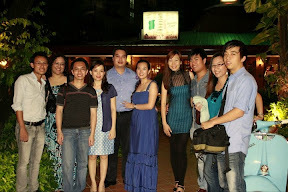 The day before Pattaya's trip, I was informed that blue would be the theme for the birthday dinner night. Not that it is a must but I personally would like to honor the birthday girl with her favorite color since I have a big piece of blue polkies sitting on my sewing desk unused. So I came home early from work, had lunch and started my 3 hours long project. I had to time myself because I was tired for some reason and I hate missing out on Sabbath evenings. In a nick of time, three hours gone and I have a dress. 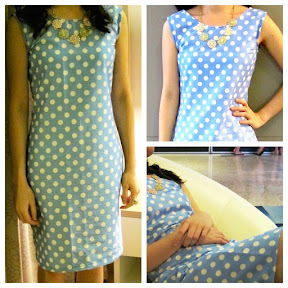 I have to say that this second attempt on a simple dress was faster and less hassle compared to my first which I blogged about here. The only major problem this time along was the sleeves. You could see traces of my frustrations stitched together on both sleeves! Yet, no one would notice if I don't raise my armpits right? Heh!! The zipper was still a pain but I managed. Not forgetting how my absent-mindedness led me to attached a short bag zipper on the dress and only noticed after I tried to unsuccessfully get into the dress!! I managed to take it off and attached the long zipper on with the help of Hobbit. Happy 4th of July to those who are celebrating! !